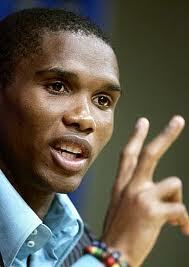 Nexdim Empire » Blog Archive » January transfers: Eto’o,Banana and Enow moving? January transfers: Eto’o,Banana and Enow moving? As the January transfer window heats up, Cameroonian players are equally at the forefront of speculations and rumours. While Schalke man Matip has extended his contract with the German side to 2016, Ajax midfielder Eyong Enow is rumoured to be a Fulham target. As usual, Indomitable Lions’ captain Samuel Eto’o isn’t spared by the speculators. The player is said to be heading Stateside. Reports,echoed by reputed -Spanish sports magazine Marca, suggest MLS giants New York Redbulls and especially L.A Galaxy are amongst those ready to sign the player . The player’s Russian club F.C Anzhi is said to be demanding no less than 50 million euros for their forward. Meanwhile,rising- defense star Yaya Banana is expected to leave Esperance de Tunis for French club Sochaux if the two parties come to an agreement.